Audio of this sermon as preached on December 14, 2003 is available online by clicking here. What is Christmas about? Most people will tell you it’s about: Presents and Santa, lights and trees, snow and days off from work and school, some will even say family and church. 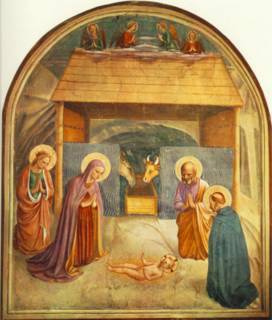 But it seems that fewer and fewer will actually state the true meaning of Christmas: The birth of Jesus Christ. A poll by the Barna Research Group in America found that only 37% of adults thought the birth of Jesus is the most important aspect of Christmas. 44% of the respondents said family time is the most important part of the Christmas celebration. 3% said presents or parties were the most important part of Christmas. The same percentage said the best thing about Christmas was getting a paid holiday. To avoid offending anybody, the school dropped religion altogether and started singing about the weather. At my son’s school, they now hold the winter program in February and sing increasingly non-memorable songs such as “Winter Wonderland,” “Frosty the Snowman” and–this is a real song–“Suzy Snowflake,” all of which is pretty funny because we live in Miami. A visitor from another planet would assume that the children belonged to the Church of Meteorology. If you were to visit earth for the first time, would you realize what we’re supposed to be celebrating. Again, as always it is important to turn to the pages of Scripture for clarification. If we look to Hollywood, we’ll be misguided. If we look to the commercial aspects of Christmas, we’ll be misguided. If we listen to the most popular Christmas songs, we may be misguided. But if we look in God’s Word, we won’t be misguided. And God’s Word tells us that Christmas is about God becoming man, which begs the question: Why Did God Become Man? Fortunately, God did not leave this question unanswered. The answer is clearly stated many times in God’s Word, one of the most accessible is Romans 8:1-4 which is the text to which I would like to invite you to turn now. There is therefore now no condemnation to them which are in Christ Jesus, who walk not after the flesh, but after the Spirit. (2) For the law of the Spirit of life in Christ Jesus hath made me free from the law of sin and death. (3) For what the law could not do, in that it was weak through the flesh, God sending his own Son in the likeness of sinful flesh, and for sin, condemned sin in the flesh: (4) That the righteousness of the law might be fulfilled in us, who walk not after the flesh, but after the Spirit. 1. We have a Problem. Those are words you don’t want to hear. Whether you’re an astronaut, air traffic controller, or a parent; those words send a chill down your spine in certain circumstances. Our problem is that one word found in verse 1 “condemnation” and its immediate context. Although this verse says there is “now no condemnation in Christ Jesus,” it assumes that those outside of Christ are still in a state of condemnation. The word “condemnation” refers to the punishment which follows sentencing in a judicial court. If the death sentence has been the verdict, the condemnation is the carrying out of that penalty by whatever means of execution used by the court. You may say, ‘That’s not a problem, everyone sins.” But it is a problem if the Christian God is real. Because the Christian God has revealed Himself as holy, so holy that sinful man cannot exist in His presence. This Holy God is our Creator and as such He deserves our whole-hearted love and worship. If the first and greatest commandment as stated by Jesus is to “love the Lord thy God with all thy heart, and with all thy soul, and with all thy mind” (Matt. 22:37), then the first and greatest sin must be to fail to “love the Lord thy God with all thy heart, and with all thy soul, and with all thy mind.” This is our problem. We are rebels against our holy Creator. The testimony of Scripture is that God is worthy “to receive glory and honour and power” because He “created all things, and for thy (His) pleasure they are and were created” (Rev 4:11). One thing we don’t need Scripture to tell us is that we’re sinners. If we’re honest with ourselves we know that all too well. For those who are not honest with themselves, God says, “For all have sinned and come short of the glory of God” (Romans 3:23). And before we take comfort by thinking that everyone sins so it isn’t such a big deal ‘to err is human,’ God adds three chapters later that “The wages of sin is death” (Romans 6:23). Yes we have a problem, a big problem. We are sinners awaiting our condemnation. 2. We have a Big Problem that We Cannot Solve. But it gets worse. Not only do we have a big problem, but it is a problem that we cannot possibly solve. We don’t like that. Especially men, we want to solve problems. Women want to talk about problems, men want to solve the problem. Maybe one day I’ll figure that out. But this is not a gender issue, it is a human issue. We all like to think of ourselves as self-made men or women. We’ve earned our own way. We’ve worked hard to have what we have. If there’s a problem, we’ll fix it without anyone else’s help! The problem with this problem is that we can’t fix it! Even the law of God could not fix this problem (see verse 3). So we either ignore the problem or pretend we’ve fixed it. Those are the two basic responses of men and women to the human problems of sin and death. Some simply ignore the problem by filling their lives with stuff, noise and pleasure. They try to pretend the problem doesn’t exist and live accordingly. Others adopt one of the many religious or philosophical solutions to the problem. The creative ones even make up a solution of their own and then spend the rest of their lives pretending they’ve solved the twin problems of sin and death. The number of different religions testify to the desire of many people to solve this problem. There’s a reason why we can’t solve this problem, even with the law of God. The problem is (look in the mirror). We’re the problem. The law is holy, just and good. There’s nothing wrong with the law. What’s wrong with “Thou shalt not kill” or “Thou shalt not steal” or “Thou shalt not bear false witness”? Nothing’s wrong with the law. The problem is that we cannot keep the law. Therefore, the law cannot deal with the problem of sin. The law can only say “That’s right.” or “That’s wrong.” It can never give the ability to do what is right or avoid what is wrong. In fact, it often does the opposite. When we’re told not to do something, there wells up deep inside us the desire to do the very thing which has been forbidden. We have a big problem that we cannot solve. The solution has to come from somewhere outside of us. 3. God Has Solved Our Unsolvable Problem. This is why the message of Christmas is so exciting. This is why God became man: to solve our unsolvable problem. Because you see, our greatest problem is also God’s greatest problem. How can He, who is holy, just and righteous, forgive we, who are unholy, unjust and unrighteous? As a holy God He absolutely must punish sin. If we question the integrity of a human judge who allows the guilty to go free, how much more unseemly would it be for the judge of all the earth to allow sin to go unpunished. For one sin to go unpunished in this universe would call into question the very existence of God. Because if the God of the Bible is not holy, He is not the God of the Bible and is therefore not God. But rest easy, God is God and He always punishes sin. But that is small comfort to us sinners. We need mercy, not justice. We want grace, not wrath. The good news is that God has orchestrated a way to forgive your sin while still remaining at the same time holy and just. But how is this possible? This is the biblical doctrine of justification. Sometimes this doctrine is difficult to understand, so let me explain it this way. Warren Wiersbe told the story of a man in England who put his Rolls-Royce on a boat and went across to the continent to go on a vacation. While he was driving around Europe, something happened to the motor of his car. He contacted the Rolls-Royce people back in England and asked, “I’m having trouble with my car; what do you suggest I do?” Well, the Rolls-Royce people flew a mechanic over! The mechanic repaired the car and flew back to England and left the man to continue his vacation. As you can imagine, the fellow was wondering, “How much is this going to cost me?” So when he got back to England, he wrote the people a letter and asked how much he owed them. He received a letter from the office that read: “Dear Sir: There is no record anywhere in our files that anything ever went wrong with a Rolls-Royce.” That is justification! 4. One Must Be In Christ to Receive the Benefits of God’s Solution to our Problem. We all know the story of Noah and the ark found in Genesis 6-9. Let me use this story to illustrate what it means to be “in Christ.” When God poured out his wrath on the earth by means of the flood, Noah and his family were spared because they were inside the ark. To be “in Christ” is to be spared from God’s wrath. One day God will once again pour out His wrath on this earth. Your only hope is being in Christ. Are you in Christ? I didn’t ask if you were in a certain church or in a particular family, but are you in Christ? Great post, Pastor Steve! Thank you. Excellent message and one that must become key in the minds of every believer. Good illustration about the Rolls. The record is clean. Calvary covers it all.